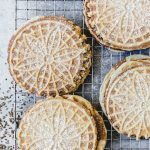 This Authentic Italian Pizzelle Recipe for the classic Italian cookie includes anise extract and anise seeds for a truly traditional pizzelle flavor with a crunchy texture. Preheat pizzelle iron. In a large mixing bowl, whisk the eggs until frothy and start to thicken, about 3-4 minutes. Add the sugar, melted butter, and vanilla and anise extracts. Whisk again until thick. In a medium mixing bowl, whisk together the flour, baking powder, salt, and anise seeds. Slowly add the flour mixture, stirring until combined. The dough will be very soft and sticky. Use a small cookie scoop to drop 1 tablespoon of the pizzelle batter onto each design in the hot pizzelle press. Close the lid and cook for 30-45 seconds or until the pizzelles are slightly golden. Remove the pizzelles from the press with a fork and lay flat on a wire rack to cool or mold into your desired shape. Dust the cooled pizzelle with powdered sugar and store in an airtight container until ready to serve.